What do I do if I have a chimney fire? Dial 999 and ask for the Fire Service. It will help if someone can wait outside to meet them. If you have a conventional open fire, extinguish the fire by gently splashing or spraying water onto the open fire. If you have a solid fuel appliance, close down the ventilation as much as possible. Move furniture and rugs away from the fireplace and remove any nearby ornaments. Place a spark guard in front of the fire. Feel the chimney breast in other rooms for signs of heat. If a wall is becoming hot, move furniture away. Ensure that access to your attic or roof space is available for the Fire Service as they will want to thoroughly check this area for signs of possible fire spread. If you see smoke or flames from any part of your home wait for the fire service outside. Devon and Somerset have more chimney fire than any other Counties in England and Wales. Chimney fires account for 40% of all accidental fire in the home. Chimney fires are easily preventable. Chimney fires can spread to the rest of your property. 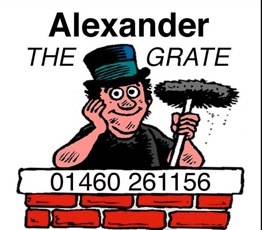 ENSURE your chimney is swept regularly. Please do FIT A CARBON MONOXIDE and SMOKE ALARMS – THEY COULD SAVE YOUR LIFE/LIVES. Why do chimneys need to be swept? A Chimney needs to be swept because it is an exhaust system for your heating appliance. If the flue is blocked or even partially blocked, this will stop or restrict hot gases or poisonous fumes from escaping from your house which could be a danger to your health and property. With a solid fuel appliance, sweeping removes the soot, creosote and tar deposits which build up and reduce the diameter of the flue. Regular sweeping significantly decreases the risk of a chimney fire. Why does my fire smoke back into the room? The flue is lined with a thick layer of soot and desperately needs sweeping. Or the flue has a bend where soot and debris has gathered causing a partial obstruction. There is an insufficient air supply: A fire needs to draw oxygen to operate correctly. Air contains 20%, so a fire need 5 times as much air to get the oxygen it needs to burn efficiently. If there is no or insufficient venting, carbon monoxide may build up in the room. With a solid fuel appliance you will smell smoke in the room and with a gas appliance you will get a build up of carbon monoxide which you will not be able to smell but will harm your health and potentially kill you. There may be a problem with ‘downdraft’. Colder air can travel down the flue. There may be nearby trees or adjacent tall buildings that cause this. The chimney pot/terminal may not be tall enough in relation to the ridge of your house. You may live in a valley where the air/wind sweeps down creating downward air pressure on your flue. There may be a nest or fallen masonry that is obstructing the flue. What is the answer? Call us and we will arrange a visit to diagnose and fix the problem. Replace an old existing fireplace. In doing so, the design features that enable a fire to draw away the smoke efficiently may have been removed. Where the fire has been opened out the new lintel is commonly rectangular and optimum dimensions of the throat have been compromised. This can also be a factor in a fire that smokes back. What types of fuels are suitable for burning? Woods should be well seasoned and preferably hardwoods. Newly cut logs can contain up to 60% water by weight. Air dried logs may still have 30-40% after one year. Room dried logs containing 20% and 25%-20% are ideal (see link below). All the water has to travel up the flue as steam. The drier the wood and the higher the flue temperature) in a stove 200c-400c approx) will significantly reduce the amount of the volatile materials (tats and creosote) condensing on the walls of the flue. Are birds nests a problem in disused chimney flues? In some cases they can be. However, please always call for advice. If not removed, Jackdaw nests can absorb moisture and create damp patches on the chimney breast, as well as bad smells. This is the most common cause of blocked chimneys. Nests are removed by sweeping them out from the bottom of the flue. Typically, the nest is constructed anywhere from the base of the flue to within a few feet of the chimney pot. We highly recommend installing a bird guard to prevent this happening. Once a nest has been built in a flue, jackdaws will habitually return year after year. Removal of nests can be damaging to the fabric of the chimney and prevention of nesting should be carried out after removal. The cost of removal varies depending on circumstances. in most cases removing of nests can only be carried out after the fledglings have departed. Copies of “Birds and the Law” are available from RSPB. Why does smoke come down a chimney in an adjacent room?